True blue flowers are natural rarities, and their color secrets aren't readily shared. Many kinds of flowering plants do not include any blue-flowering varieties, though people go to great lengths to create them. The color doesn't come easily because true blue pigment doesn't exist in plants. Instead, other pigments and plant minerals combine with wavelengths of light to create the colors people see. Among all the purples, violets and reds, some naturally blue flowers result. Blue Himalayan poppies (Meconopsis spp.) have captivated imaginations since they were discovered on a mountaintop. Cool, wet summers and cold, snowy winters define the regions in U.S. Department of Agriculture plant hardiness zones 3 through 9 where blue poppies may survive. The deep, sky-blue, crepelike blossoms appear most reliably on plants given partial shade and moist, compost-rich soil in the Northeast, Pacific Northwest and Alaska. Even then, the coveted blue blooms often elude gardeners because the poppies take years to flower and then promptly die. 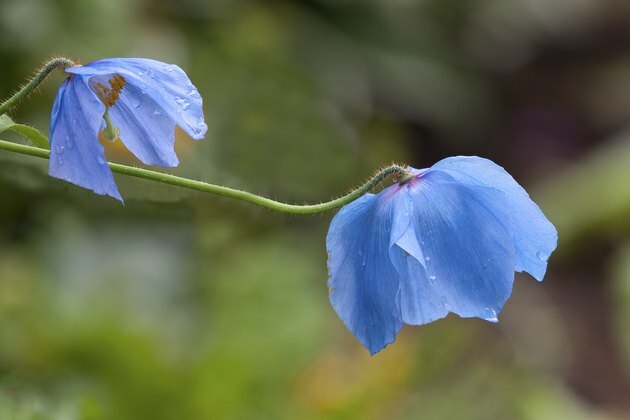 The hybrid blue poppy (Meconopsis x sheldonii, USDA zones 7 through 8) provides adventurous gardeners with hope for naturally blue perennial blooms. From deep navy to pale, powder blue, grape hyacinths (Muscari spp.) offer long-lasting naturally blue blossoms in USDA zones 4 through 9, depending on the species. The bulbs naturalize readily, creating blue swaths throughout woodlands and lawns when their fragrant, early-spring blossoms burst into view. "Blue Magic" grape hyacinth (Muscari aucheri "Blue Magic," USDA zones 4 through 9) offers one of the truest garden blues and lends the color to forced indoor bulb gardens too. 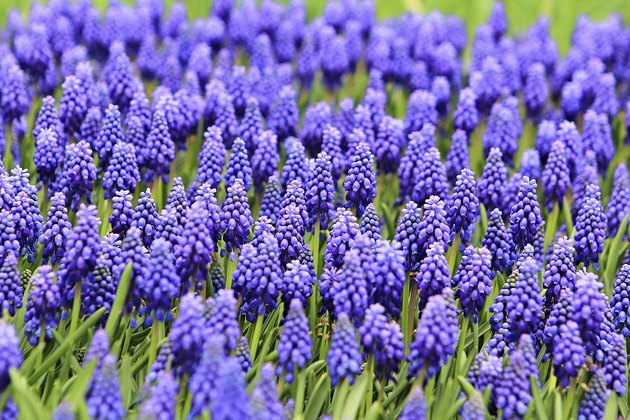 Grape hyacinths adapt to all fertile soils, including alkaline soils, as long as drainage is good. Give these undemanding bulbs full sun in early spring before tree leaves unfurl and full sun to partial shade afterward. 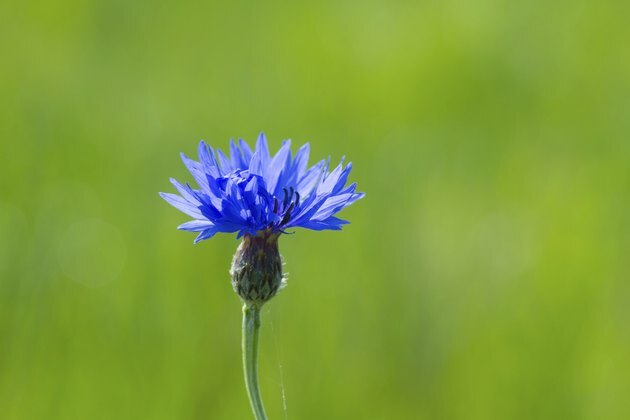 Annual cornflowers (Centaurea cyanus), also known as bachelor's buttons and blue bottles, provide abundant, intense blue flowers from spring through fall. The exuberant European native frequently escapes cultivation, invades neighboring fields and leaves them dotted with vivid, natural blue. The nectar- and pollen-producing flowers attract garden pollinators and grow easily from seeds sown directly in the ground in spring or self-sown the previous fall. 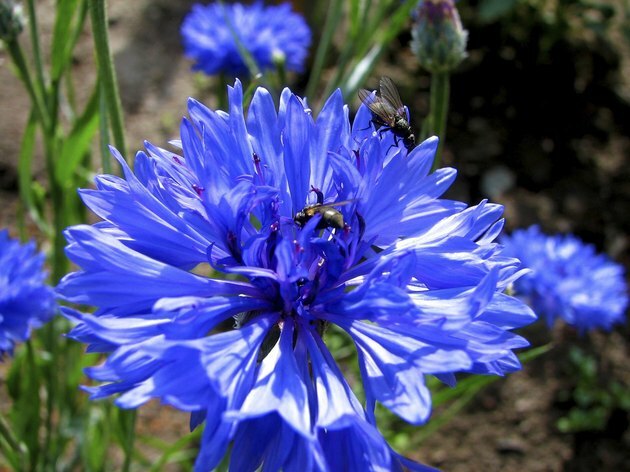 Full sun and ordinary garden soil suit cornflowers fine, but their blooms shut down without consistent moisture in times of drought. "Blue Diadem" cornflowers (Centaurea cyanus "Blue Diadem") offers double flowers -- twice the usual number of naturally blue petals per bloom. Blue morning glories (Ipomoea tricolor cvs.) and their heart-shaped leaves greet the sun with prolific, naturally blue blossoms that last only a single day. The twining annual vines climb or sprawl up to 15 feet and self-seed aggressively. 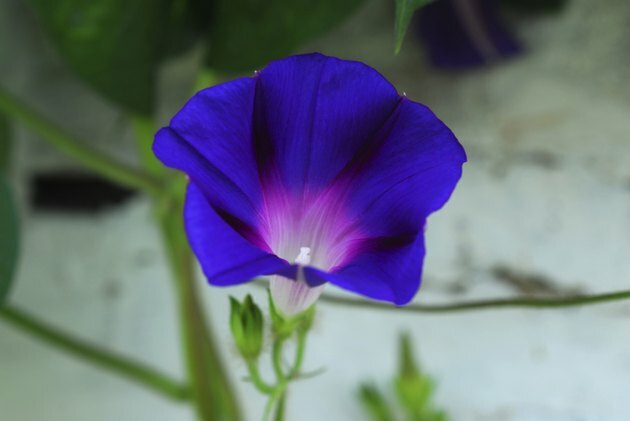 Some of the biggest blue blossoms belong to "Heavenly Blue" morning glory (Ipomoea tricolor "Heavenly Blue"), a hummingbird and gardener favorite. It prefers full sun and lean, slightly dry, slightly alkaline soil; too much fertility leads to rampant vines and too few blue blooms. In cool climates, start warmth-loving "Heavenly Blue" seeds indoors, and soak the hard-coated seeds overnight or nick their shells to speed germination. Keep morning glory seeds away from children and pets; they are highly toxic when ingested. Delphiniums (Delphinium spp.) provide naturally blue flowers with the help of the plant pigment delphinidin, which is behind the blues in many flowers. Delphiniums do best in USDA zones 3 through 6 and the cool, moist-summer regions of USDA zones 7 through 8, depending on the variety. The ultra-vivid blue blooms of "Blue Butterfly" (Delphinium grandiflorum "Blue Butterfly") and gentian-blue blossoms of "Blue Mirror" (Delphinium grandiflorum "Blue Mirror") provide natural, all-summer blues in USDA zones 3 through 6. 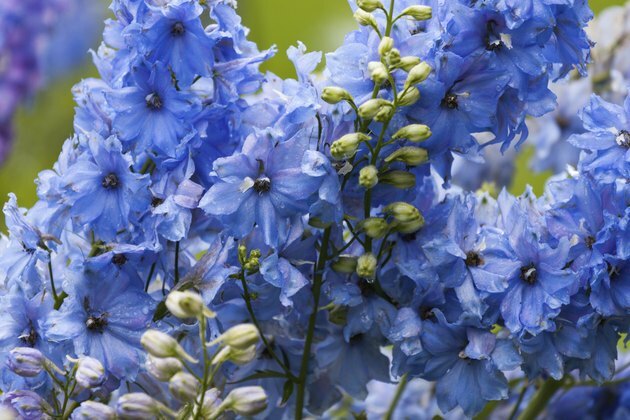 Give delphiniums excellent drainage and neutral to slightly acidic soil, and side-dress these heavy feeders with compost at planting time, at flower set and again after they flower. Deadhead spent blossoms regularly to promote more of their naturally blue blooms. 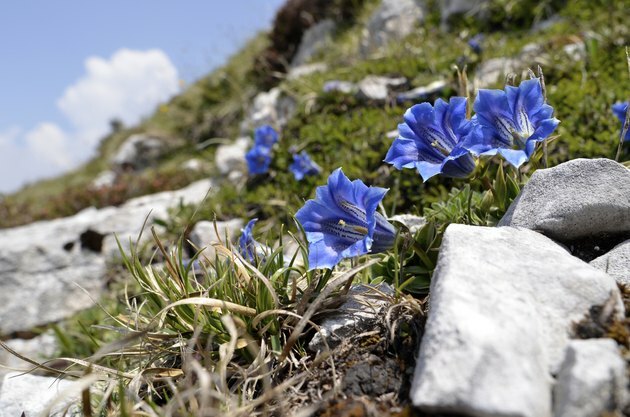 The plant family Gentianaceae provides some of the plant kingdom's most enthralling naturally blue blossoms, from annuals and biennials to perennials worldwide. When the poet William Cullen Bryant wrote of their lashlike, fringed petals "colored with the heaven's own blue," the elusive fringed gentian (Gentianopsis crinata) was his muse. Biennial in USDA zones 3 through 8, its vivid, royal-blue blooms appear in its second year then often disappear as inexplicably as they came. Perennial "True Blue" gentian (Gentiana x "True Blue") brings dependable, long-lasting, natural blues from midsummer through fall in USDA zones 4 through 8 gardens with consistently moist soil and full to partial sun exposure.